Readers of a certain age will readily recognize Charles Coburn from his career in the movies. From 1933 until his death in 1961 he appeared in ninety-three films and television shows; he became such a celebrity that he made personal guest appearances in eleven additional programs as himself. Along the way he picked up an Academy Award (Best Supporting Actor, The More the Merrier, 1943) as well as several nominations for his film roles. He was born in Macon and grew up in Savannah, Georgia, and began his career in regional theater, making his first Broadway appearance in 1901; over the years he performed in twenty-eight plays on Broadway, one of them Troilus & Cressida as Ajax with his wife Ivah in the part of Andromache. 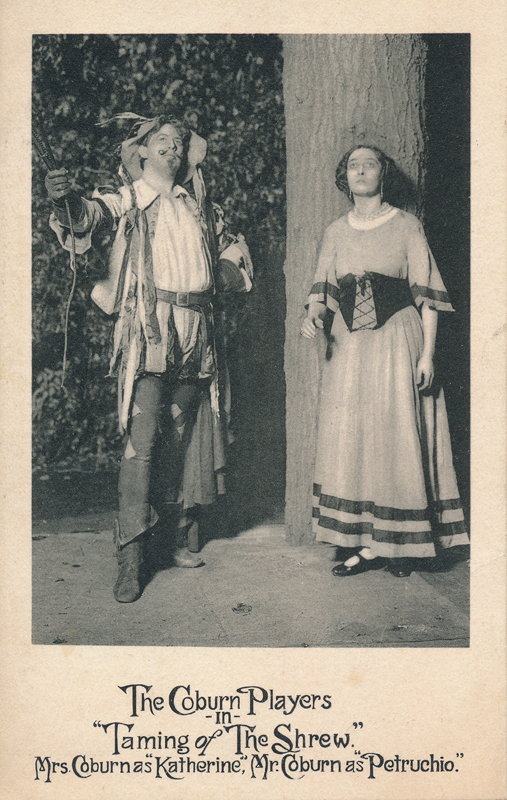 Below is a card of Coburn and his wife, Ivah Wills, as Petruchio and Kate in The Taming of the Shrew. But his first endeavors were with Shakespeare when in 1905 he formed and managed the Coburn Shakespearean Players with Ivah Wills, whom he married the following year in Atlanta. The company toured for decades until Ivah’s death in 1937. He then disbanded the company and went to Hollywood where he became an established actor in films, his major legacy. While he was with his own company from 1905 until 1937 he performed every leading role in Shakespeare’s plays. Coburn was a member of the Motion Picture Alliance for the Preservation of American Ideals, an anti-communist conservative group, which included in its membership such names as Walt Disney, Ronald Reagan, and Cecil B. DeMille. He was also a member of the White Citizen’s Councils, a supremacist group which opposed racial integration, particularly in Hollywood. In 1960, he was honored with a star on the Hollywood Walk of Fame, located at 6268 Hollywood Boulevard, in Los Angeles.